STORRS, Conn. (AP) UConn coach Kevin Ollie says it will take some time to identify specific roles for all the new players on his team. It may also take time for everyone else to identify who those guys are wearing Huskies uniforms. 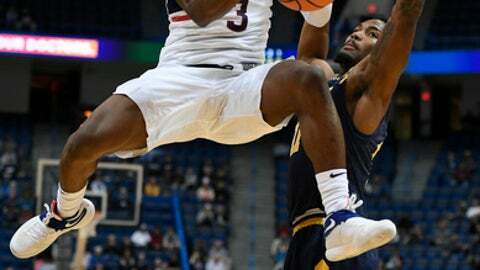 Just two players, guards Jalen Adams and Christian Vital, saw significant playing time on the team that finished a disappointing 16-17 last season, including 9-9 in the American Athletic Conference. The strength of the team appears to be at the guard position, where Adams and Vital will be joined by Alterique Gilbert, Fordham graduate transfer Antoine Anderson and swingman Terry Larrier. Gilbert was granted a medical redshirt after being lost to a shoulder injury three games into last season. Larrier, a transfer from VCU, missed all but four games after blowing out his left knee in the Maui Invitational Tournament. The biggest questions come in the frontcourt, where graduation and transfers have left the Huskies with nobody over 6-foot-9. Redshirt freshman Mamadou Diarra, who sat out last season with knee problems, started in the post in the Huskies first preseason game. Junior college transfers Eric Cobb and Kwinton Williams; freshmen Josh Carlton, Isaiah Whaley and Tyler Polly, and grad David Onuorah a graduate transfer from Cornell, are all in the mix. UConn, which was picked to finish 5th in the AAC’s preseason poll, opens at home on Nov. 10 against Colgate. The Huskies were able to get in an extra preseason game in this year after the NCAA cleared them to face Providence in a contest that benefited the Red Cross disaster relief efforts. The Friars dominated the matchup of former Big East rivals, leading by 27 points in the second half before winning, 90-76. Eleven Huskies got into the game. The Huskies beat Division II Merrimack in their second preseason game 79-63, getting 70 points in the paint. The Huskies are still waiting to hear whether freshman Sidney Wilson, who transferred from St. John’s after taking a single summer school class, will be allowed to play this season. The 6-7, highly recruited wing is seeking an NCAA waiver rather than sit out a year as a transfer student. Gilbert was named the AAC’s preseason rookie of the year, for the second straight season. He was eligible for the honor after playing just 87 minutes last year before dislocating his left shoulder against Loyola Marymount. It’s the fourth straight season the Huskies have won the award. Daniel Hamilton won it in 2014 and Adams received the honor in 2015. UConn enters the season having made a 3-point basket in 278 consecutive games, a streak that dates back to Nov. 27, 2009, a loss to Duke in the championship game of the NIT Season Tip-Off Tournament. Adams, a junior, has played in 68 games for UConn, by far the most of any player on the team. Vital is next on that list, having played in 31 games. He’s followed by two walk-ons. Senior forward Christain Foxen has played 24 minutes in 19 games as a Husky. Guard Michael Noyes, a grad student has played a total of 13 minutes in 10 games.